The new 2005 editions have been redesigned in a larger format which provides more color area with which to work, improved readability of important color data and better accessibility to all colors on the pages. The formula guide is an essential tool for graphic designers, pre-press professionals and printers. Its simple design provides a convenient and portable reference that can accompany you at client presentations or on press. 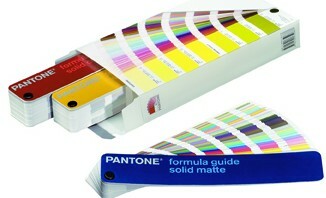 The 1201 two-guide set contains 1,114 PANTONE Colors on coated and uncoated stock The 1202 three-guide set contains 1,114 PANTONE Colors on coated, uncoated and matte stocks. The new 2005 edition has been redesigned in a larger format which provides 25% percent more color area per chip and improved handling. These sets include six perforated chips for each solid PANTONE MATCHING SYSTEM® Color, making it easy to select, specify and communicate color on coated, uncoated or matte stocks. Attach color reference chips to artwork and digital files to ensure that you get a perfect match every time. Note: Individual replacement pages are available for all Chip Book formats. Order multiple - 4 of same page. Contact us for details. - Two complete PANTONE Libraries in one device. - Identifies neighborhood colors - lighter/darker colors, redder/greener colors, yellower/blues colors, close colors.